Even as temperatures are rapidly climbing back toward the much more familiar “fry an egg on the sidewalk” range in Texas, it’s only been a couple of weeks since schools, businesses and even conference service centers in the Fort Worth area were caused to shut down due to the ice and snow. (Good old March…in like a snow leopard and out like a lobster.) But Old Man Winter wasn’t successful in stopping everyone. It seems that the folks at Smithfield UMC didn’t get the message that snow in Texas meant the world had to stop. Or maybe, they just figured that doing everything they can to build a Healthy Church that is outwardly focused on its community and is doing all it can to make disciples of Jesus Christ for the transformation of the world was worth the risk. Whatever their motivation, the people of Smithfield UMC put a whole new (and quite positive) spin on the phrase “coalition of the willing” on Friday, Feb. 27, when one of the many recent storm systems of snow and sleet rapidly approached the Fort Worth area. On that blustery day, a team of six Healthy Church Initiative (HCI) consultants made their way to Smithfield UMC to begin a consultation weekend. The team, made up of three laity and three clergy from the Central Texas Conference, arrived on-site at 7:30 a.m. – just as snow flurries began to ominously fall. Dr. Lisa Neslony, pastor of Smithfield UMC and one of 10 planned interviews for the day, greeted the team in her usual radically hospitable way with hot coffee and a warm welcome to the North Richland Hills-area church. With a slate of 10 interviews scheduled with SUMC staff and laity and the snow beginning to accumulate, the team began to wonder about the feasibility of the task at hand. Could those who were scheduled to be interviewed even get to the church? To the HCI team’s surprise, all of the interviewees braved the increasingly treacherous roads and made their appointed interview times. Some church members even went so far as to pick up others who were snowed in. And the commitment to excellence didn’t stop with those being interviewed as throughout the day you could hear other church members clearing walkways, stairwells and the parking lot to allow the HCI team and those involved to get their work done to the best of their ability. The fact that so many showed up in rather severe weather conditions for the Fort Worth – Dallas (FWD) area to share what God might be up to at Smithfield UMC demonstrated an outstanding commitment to the HCI process - and an even stronger commitment to each other and their community. As the day grew on and the ground grew whiter, it was decided that it would be best for everyone’s safety to cancel the evening focus group and attempt to re-group at the church the following day at noon. The consultation team was able to find rooms at a hotel just few miles from the church and successfully crept through the ice and snow to rest for the next day. On Saturday morning, the roads remained icy and the temperature did not climb by noon as predicted. As such, the team began to wonder if SUMC would be willing and able to convene at all. That question was quickly resolved by a phone call to Rev. Lisa, who informed the team that the catered luncheon was being delivered and the church-wide workshop was moving forward. That’s just how they roll at Smithfield UMC. Still, even with Rev. Lisa’s energetic assurance, the HCI consultant team assumed attendance would be quite understandably light. However, another surprise awaited as they slid up to the church and pulled into a rapidly filling parking lot. 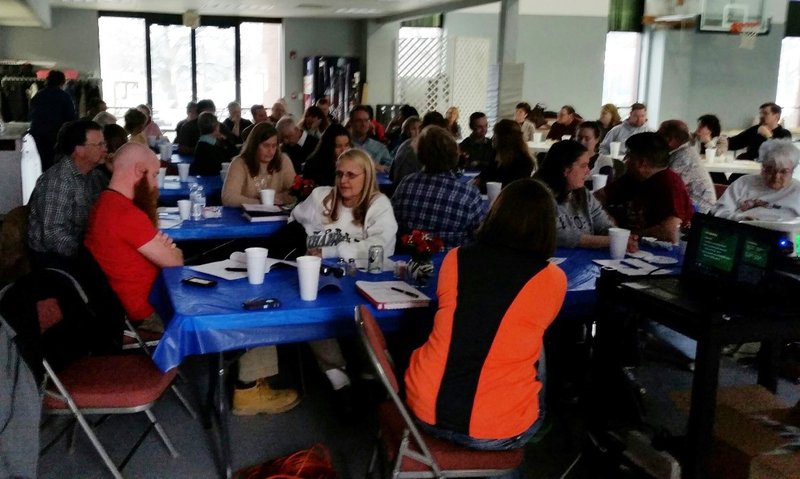 Smithfield members had once again defied the conditions and were streaming into Smithfield’s Family Life Center! Undeterred by road conditions and additional freezing rain, more than 60 members came out to attend the HCI event – which would be a wonderful turnout on a picture perfect weather day! Rev. Ben Disney, senior pastor of Arborlawn UMC and lead consultant for the weekend, remarked on the energy and palpable excitement of those who gathered to assess the current health and future direction of the congregation. Even though the temperature never did rise above freezing that weekend, the warmth of the Spirit blazed in the boldness and determination of the people of Smithfield and provided an experience that no one in attendance will soon forget - one that will help propel this vital congregation to go out into its community and the world and effectively make disciples for Jesus Christ. Smithfield marks the thirtieth consultation in the Central Texas Conference since the launch of the HCI in 2012. The Healthy Church Initiative is a process of shared learning experiences, consultation and coaching, which seeks to energize and equip churches to fulfill The Great Commission.